Proteins are macronutrients made of amino acids. They are essential nutrients found in both animal and plant foods. The name protein originates from the Greek proteios, which means “first quality” . The calorie value for protein on the Nutrition Facts labels of foods is 4 Calories per gram, which represents “metabolizable energy,” which can be used by the human body. But if we distract the energy used to digest, absorb and metabolize protein, we get 3.2 Calories per gram of “net metabolizable energy,” which can be converted to physical energy or body weight [2,3]. Net metabolizable energies for carbohydrates (4 Cal/g) and fats (9 Cal/g) are practically the same as their metabolizable energies [2,3]. Structural proteins: Collagen gives the structure to the bones, skin and connective tissue (tendons and ligaments); elastin gives elasticity to the skin; keratin gives structures to the nails and hair; keratin is also in the upper layer of the skin; actin and myosin enable muscle contraction, and cell membrane proteins regulate influx and outflux of certain substances into and out from the cells. Transport proteins: Hemoglobin carries oxygen, and transferrin carries iron in the blood; myoglobin carries oxygen in the muscles; ferritin stores iron, and cytochromes carry electrons in the respiratory chain in the cells; albumin carries certain ions, hormones, vitamins, bilirubin, drugs and toxins via the blood. Albumin also helps to retain water in the blood. Enzymes enable synthesis or breakdown of most substances in the body. Thrombin and fibrin enable blood coagulation; fibrin also enables wound healing. The hormones insulin, oxytocin, somatotropin and thyroxine are proteins. Proteins released into the blood in inflammation: C-reactive protein, prostaglandins, prostacyclins. Antibodies (immunoglobulins IgA, IgE, IgG, IgM) enable defense against microbes (immunity). Protein deficiency can affect all above functions. Synthesis of proteins in the human body is regulated by DNA . According to the Institute of Medicine (IMO) in the U.S., the Recommended Dietary Allowance (RDA) for protein is 0.8 g/kg or 0.36 g/lb body weight per day; in average 56 g/day for men and 46 g/day for women . The Acceptable Macronutrient Distribution Range (AMDR) for protein for adults is 10-35% of total calories consumed or 50-175 g/day . Chart 1 source: Adapted from Institute Of Medicine , US Department of Agriculture [50-pp.176-178] and WebMD  ** The lower AMDR values in age groups 4-18 years seem to be set too high. According to one estimation, adults need to consume at least about 35 grams of protein per day [97-p.324] in order to get enough essential amino acids and nitrogen for the synthesis of the body proteins, DNA and RNA (parts of chromosomes). How long can you live without protein? According to various reports, people have survived for more than 40 days without food and hence without protein . After prolonged starvation, people can die even before their fat stores are depleted, probably due to deficiency of essential amino acids . Losing 1/3 to 1/2 of the body protein, which is about 3 kg of muscle mass, may be incompatible with life . To maintain muscle mass in athletes during calorie-deficit diet: 1.8-2 g/kg body weight  or even 2.3-3.1 g/kg of fat free mass . There is INCONCLUSIVE EVIDENCE about the importance of the time of protein ingestion on muscle mass gain and strength in resistance-trained athletes: from no effect of the ingestion time  to greater effect if ingested immediately after exercise than when ingested at some later time [142,143]. While some researchers believe, the maximum amount of protein in one meal that can stimulate protein synthesis is 20-30 grams, others believe no such maximum exists . During calorie-restricted diet for weight loss, the synthesis of the muscle protein is not impaired but its breakdown is increased, which can result in a decrease of muscle mass . A combination of a high-protein low-carbohydrate diet and exercise during weight loss can help prevent muscle mass loss [131,134]. High blood levels of amino acids (hyperaminoacidemia) and hormones insulin inhibit muscle protein breakdown; growth hormone, insulin-like growth factor (IGF-I or somatomedin C) and testosterone stimulate protein synthesis [103,106]. Glucagon and thyroxine stimulate muscle protein breakdown . Fish, cooked (3 oz, 85 g): grouper, haddock, herring (Atlantic), mackerel, octopus, salmon, sardines, sea bass, tilapia, tilefish, tuna 20-25 Big fish from the Gulf of Mexico (king mackerel, shark, swordfish, tilefish, tuna) may be high in mercury or other toxins. In various studies, in general, plant protein was associated with less health risk than animal protein [53,62], but the direct cause-effect relationship between plant protein and health risks has not been proven. There is insufficient evidence about the effect of soy protein intake on total and LDL cholesterol levels [53,64]. There is a small and inconsistent evidence about the association between the intake of red and processed meat and colorectal cancer . There is inconclusive evidence about the association between the intake of animal protein and kidney stones . High intake of total protein or animal protein was not associated with gout . Limited inconsistent evidence from prospective cohort studies suggests that intake of animal protein products, mainly processed meat, may be associated with diabetes mellitus type 2 . Foods with complete protein contain all 9 essential amino acids in sufficient amounts to meet the body needs. Most animal foods and some plant foods: amaranth, avocado, buckwheat, chestnuts, certain legumes (certain beans, chickpeas or Garbanzo beans, split peas, soy), pistachios, potatoes, pumpkin seeds, quinoa, a seaweed spirulina, spinach, tofu and hummus contain complete protein . Some plant foods contain incomplete protein, which means they are low in certain essential amino acids . Plant foods with incomplete protein do not need to be called “low quality” protein sources because their combining can provide sufficient amount of all essential amino acids to meet the body needs. Complementary protein foods are foods that are low in certain essential amino acids, but in combination, provide all 9 essential amino acids in amounts that allow synthesis of adequate amounts of protein in the human body. Examples of complementary protein foods are cereal grains, nuts and seeds, which tend to be low in lysine and tryptophan, but high in methionine, in combination with legumes, which tend to be high in lysine and tryptophan but low in methionine. Complementary proteins do not need to be eaten in the same meal or even not in the same day, but, according to The American Journal of Clinical Nutrition, “over number of days” . They are usually only vegans who need to think about complementing proteins. Vegans, who do not eat meat, fish, eggs and milk products, can get enough protein by eating nuts, seeds, legumes, bread, rice and other plant foods high in protein (Chart 2). Various protein bars, meatless products (meat substitutes), seitan (wheat gluten), vegan protein shakes and other protein products are available. Healthy vegans who eat variety of plant foods in sufficient amounts do not likely need protein supplements . In order to be absorbed, proteins have to be digested (broken down) to amino acids. The enzyme pepsin in the stomach and the enzymes trypsin and chymotrypsin, produced by the pancreas and delivered to the small intestine by pancreatic juice, break down protein to short chains of amino acids. The enzymes peptidases in the small intestinal lining further break down chains of amino acids to either single amino acids or compounds of 2 (dipeptides) or 3 amino acids (tripeptides), which can all be absorbed [68,70]. Exceptionally, mainly in newborns, some intact food proteins can be absorbed . The estimated absorption rate for protein (amino acids) is 1.3-10 grams per hour , depending on the type of protein. Whey protein (from milk) is digested and absorbed faster than casein (from milk) and most other dietary proteins . Protein hydrolysates (supplements with short chains of amino acids) are absorbed faster than free amino acids or whole proteins [71,77]. The eventual upper limit for protein absorption is not known; according to European Food Information Council, more than 90% of the ingested protein should be absorbed . Protein digestion and absorption can be impaired in certain pancreatic and intestinal disorders, such as pancreatitis, pancreatic cancer, partial surgical removal of the pancreas or small intestine, celiac or Crohn’s disease, intestinal lymphoma or tuberculosis and cystic fibrosis . Low gastric acid secretion (achlorhydria or hypochlorhydria) probably do not significantly affect protein digestion [132-p.33; 133]. Severe protein malabsorption can lead to low blood protein levels (hypoproteinemia or hypoalbuminemia) and body swelling (edema) . Supplemental pancreatic enzymes, usually as capsules that contain enzymes required to digest proteins (trypsin), fats (lipase) and carbohydrates (amylase), are available by prescription or over the counter. When amino acids (breakdown products of protein digestion) are absorbed into the blood, they enter liver, muscle and other body cells, where they can be converted to muscle and other body proteins, glucose or further to glycogen (a storage form of glucose in the liver and muscles), fatty acids or further to ketones (a source of energy for the brain during low-carb diet) or body fat stores, or can be converted to energy (physical, chemical and thermal) . The excessive protein nitrogen is excreted in the form of urea in urine. When you consume more calories than you spend, some protein will be converted to the body fat. In a low-carbohydrate, high-protein diet, some protein will be used for energy for your body, some will be converted to glucose and some to ketones, both of which can be used as a source of energy for the brain. During resistance training, some protein will be converted to muscle proteins, which will increase your muscle mass. Some researchers believe that Recommended Dietary Allowance for protein (0.8 g/kg body weight for adults) is enough to build muscles during resistance training. During cooking, protein undergoes denaturation ─ a physical change that makes it easier to digest. During denaturation, protein does not break down to amino acids and its calorie value does not change significantly. 30-40% less protein may be absorbed from raw than from cooked eggs [79,80]. Regular consumption of raw egg whites, which contain a protein avidin, which can bind the vitamin biotin, can result in biotin deficiency; avidin from cooked egg whites does not bind biotin [81,82]. Cooked meat is digested easier than raw meat. Meat protein denaturates at about 84° C (183° F) . Raw and cooked milk protein are probably digested at about the same rate. The body’s heat production (thermogenesis). The thermic effect of a high-protein meal can be as much as twice higher than of a high-carbohydrate meal [21,25,26,27]. Lower body fat percent. In various studies, high-protein, calorie-deficient diets were associated with greater percentage of body fat loss than low-protein diets [13,21,29]. Inconclusive for body composition . Decrease of high blood pressure. 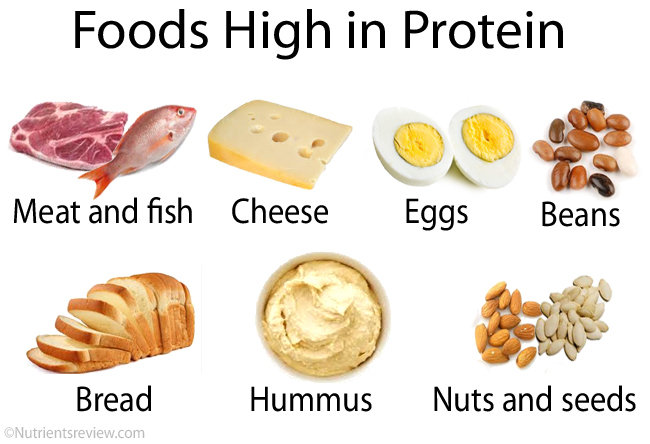 There is some evidence that a high-protein diet and diet high in plant protein are associated with a slight decrease of blood pressure [11,30,31,32,33,63]. Weight loss. There is some evidence that high-protein diet can increase satiety but insufficient evidence about its long-term (>1 year) effect on weight loss [10,11,18,19,21,27,53]. For patients with end-stage liver disease with hepatic encephalopathy, some authors recommend 1.2-1.5 g protein/day, preferably vegetable protein, except to those with severe protein intolerance [91,92,93]. Gastrointestinal problems. According to some, but not all studies, in some individuals, high-protein diets can be associated with bad breath (halitosis), diarrhea, bloating and, when a diet is low in fiber, constipation . Impaired kidney function. In healthy people, high-protein diet or protein supplements, like whey, probably do not impair kidney function or cause kidney damage [9,17,19,21,53]. Kidney stones. In healthy people, high-protein diet alone does not likely increase the risk of kidney stones [9,19,20,40,53]. In high protein diet, urine is more acidic, higher in calcium and urate but this is probably not enough to form calcium or urate kidney stones [9,14]. In individuals with certain metabolic disorders, high-protein diet, especially diet high in animal protein (meat, organ meats, fish, eggs), can increase the risk of urate and cystine kidney stones, though [9,85]. Diabetes mellitus type 2. In some, but not all, studies, high-protein diet was associated with increased risk of diabetes 2 [136,139]. Osteoporosis. A high-protein diet results in increased calcium excretion in urine, but it does not likely increases the risk of osteoporosis (low bone density) [15,19,53]. Heart disease. High protein intake does not likely increase the risk of coronary artery disease and high blood pressure [9,11,17,23,24,53]. Inflammation. Neither high- nor low-protein diet are consistently associated with inflammation (concluded from insignificant changes in blood C-Reactive Protein or CRP levels) [11,39]. Cancer. There is insufficient evidence about association between diets high in protein or animal protein and the risk of breast, prostate, colorectal or other cancer [18,41,42,43,44,53]. The long-term (>20 years) effects of a high-protein, low-carbohydrate diets on health are not known . In various studies, high-protein diet was associated with slightly lower blood triglyceride, lower LDL and slightly higher HDL cholesterol levels [11,17,22,23,37]. To date, the exact maximum safe protein intake for healthy individuals is not known. The Institute Of Medicine in the U.S. has not established the Tolerable Upper Intake Level (UI) for protein . According to one study, the human kidneys of adults can excrete only the amount of protein metabolic products (urea) that corresponds to ingestion of about 250 g protein/day by a 70 kg person, but this maximum may increase during a long-term high-protein diet [50-p.694]. According to one source, a suggested maximum protein intake for an 80 kg person on a 2,800 Calorie diet is 2-2.5 g/kg body weight per day or 176 g/day  and “theoretical maximum safe intake” for an 80 kg person is 285-365 g/day . The human liver has a limited capacity to metabolize proteins, so excessive protein intake (> 35% of total calorie intake) may result in increased blood levels of amino acids (hyperaminoacidemia), ammonium (hyperammonemia) and insulin (hyperinsulinemia), and even death . According to an explorer Stefansson (in 1940s and 1950s), several weeks of eating only lean meat, such as rabbit or caribou meat, which contains very little fat, and eating no other food, can result in death due to so called “rabbit starvation syndrome” [47,96]. One adult man consuming about 45% calories from protein for more than a week has experienced weakness, hunger, nausea and diarrhea, which were resolved by increasing fat intake and reducing protein intake to 20-25% calories . On the other hand, according to several reports, eating only meat or pemmican (dried meat with added fat) containing 20-35% calories from protein and the rest from fat for “extended periods” did not cause any adverse effects . Food protein intolerance is an adverse reaction to protein with one or more gastrointestinal symptoms (burning mouth, nausea, vomiting, abdominal pain, constipation or diarrhea), skin rash (hives, eczema), runny nose, difficulty breathing or wheezing occurring within few minutes to hours after food ingestion. Food protein allergy is a type of protein intolerance with increased release of IgE antibodies. Cow’s milk, soybean and eggs are most common triggers of protein intolerance in children; intolerances often resolve before age of five but may, rarely, persist into adulthood. Practically any other food, including meats, fish, shellfish, nuts, seeds and foods that contain very little protein, such as fruits, vegetables and oils, can be involved in protein intolerance. Intolerances to more than one protein are possible; infants with cow’s milk intolerance are often intolerant to soy protein. Disorders related to protein intolerance include oral allergy syndrome, immediate gastrointestinal hypersensitivity, eosinophilic esophagitis, gastritis and gastroenteritis; enterocolitis, protein-losing enteropathy, proctocolitis, chronic constipation (as the sole symptom), atopic dermatitis, multiple food protein intolerance of infancy (to several foods, including breast milk) and celiac disease (adverse reaction to gluten). In infants with cow’s milk intolerance, rarely, anaphylactic shock (pale, sweaty, cold skin) due to a sudden drop of blood pressure can develop. Decreased secretion of gastric acid (hypochlorhydria) or using gastric acid lowering drugs (antacids, H2 blockers, proton pump inhibitors) increases the risk of protein allergies, because a lower amount of acid in the stomach allows more intact proteins to pass into the intestine . Diagnostic tests can include skin tests with food extracts, food eliminating and oral challenging tests, blood IgE levels, leukocytes in the stool, endoscopy with biopsy of the GI tract lining, etc. Treatment possibilities: elimination of the offending food, exclusive breastfeeding instead of bottle feeding, free amino acids-based formula, antihistamines, corticosteroids; in case of anaphylactic shock: epinephrine injection into a muscle. Cooking fruits, vegetables and oils, but less likely other foods, can make them less allergenic . If you have a kidney, metabolic or other disease, your doctor may prescribe you a low-protein diet. Most nuts (1 oz, 28 g): pistachio, peanuts, hazelnuts, walnuts, etc. Most seeds (1 oz, 28 g): sunflower, pumpkin, chia seeds, etc. Most vegetables (1/2 cup, 120 mL): broccoli, Brussel’s sprouts, cabbage, carrots, eggplant, kale, lettuce, tomatoes, etc. Chart 3 sources: USDA.gov . NOTE: The above chart is for general information only; it is your doctor or dietitian who can tell how much protein you personally can eat. Individuals with certain genetic metabolic diseases, certain amino acids accumulate in the blood, so they should have a diet low in those amino acids. In kidney failure, in which a breakdown of protein metabolism (urea) accumulates in the blood (uremia), a low-protein diet was associated with a decreased risk of death due to kidney disease [87,89,105]. However, patients on hemodialysis are usually advised to consume more protein, which can help them maintain muscle mass and stimulate tissue repair [88,90]. Low-protein diet or diet low in animal protein can help prevent recurrence of urate kidney stones [85,94]. Improvement of symptoms of Parkinson’s disease . A diet low in animal protein and high in cereals can increase the risk of ammonium acid urate bladder stones in children, mainly in tropical areas with poor nutrition . According to one 2002 review of studies, protein added to carbohydrate meals probably does not slow glucose absorption . Protein meals do not increase blood glucose levels after the meals [48,104]. In various studies in individuals with diabetes mellitus 2, long-term (at least 1 year) high-protein diets did not result in a significantly different glycated hemoglobin (HbA1c) than high-carbohydrate diets [11,22,37]. A low-protein diet may slightly slow down the progression of kidney disease in individuals with diabetes mellitus type 1 or 2 [34,38]. In order to maintain nitrogen balance an adult has to consume at least about 35 grams of protein per day [97-p.324]. Decreased protein absorption due to small intestinal disorders: severe gastrointestinal infections, intestinal parasites, celiac disease, Crohn’s disease, Whipple disease, lymphoma, intestinal tuberculosis, cystic fibrosis, surgical removal of a large part of the small intestine in infants (short bowel syndrome or SBS) or other disorders with severe diarrhea. Loss of protein through the gut–protein-losing enteropathy–as small intestinal bacterial overgrowth (SIBO), intestinal parasites, celiac disease, Crohn’s disease, ulcerative or pseudomembranous colitis, HIV/AIDS, tuberculosis, amyloidosis, systemic sclerosis and lymphoma . Severe protein deficiency due to lack of protein in the diet may be still a problem in southern parts of African and Asia. Kwashiorkor, which in the Ga language of Ghana means “the sickness of weaning,” is a protein deficiency without a calorie deficiency. It mainly affects small children after stopping breastfeeding, who get enough carbohydrates, but not enough proteins with food. Marasmus, from Greek marasmos = wasting, is a combination of protein and calorie deficiency. The main cause is prolonged starvation. Protein deficiency in pregnant women may result in low birth weight and impaired brain development in infants. Blood tests: decreased levels of total protein (hypoproteinemia) or albumin (hypoalbuminemia; ), blood urea nitrogen (BUN), transferrin, glucose (hypoglycemia), cholesterol, iron, potassium, magnesium, calcium, phosphate, vitamins and decreased lymphocyte count. Stool tests can reveal increased amounts of protein in protein-losing enteropathy, increased amount of fat in pancreatic disease, blood in inflammatory bowel disease, etc. Complications of protein deficiency include failure to grow, increased risk of infections, fatty liver, impaired kidney function, impaired brain function in infants, or death [100-p.609]. Treatment of kwashiorkor and marasmus includes replacement of minerals and vitamins, carbohydrates and fats (small amounts initially) to provide calories, followed by proteins (milk-based formula for children). Low blood albumin levels can be caused by infection or inflammation: hepatitis, (HIV/AIDS), arteritis (vasculitis), chronic kidney disease, burns, sepsis, and also trauma or surgery. Conclusions of several systematic reviews of studies about the effect of protein supplements during resistance training are mixed: from no effect on endurance performance  or muscle function after exercise  to possible positive effect on muscle mass and strength, aerobic and anaerobic power in both younger and older individuals [76,107]. Protein supplements seem to have no effect on muscle mass gain in the initial weeks of resistance training in previously untrained individuals . Whey concentrate can contain 35-80% protein; the rest is mostly lactose . Whey protein isolate contains 90-96% protein and, sometimes, some lactose . Whey protein hydrolysate contains parts of protein that has been broken down (hydrolyzed) to short chains of amino acids (dipeptides, tripeptides) and some free amino acids; it is absorbed faster than intact whey protein and and also less commonly triggers allergic reactions . Liquid whey and “protein water,” which is purified water with added whey, are on the market. Certain whey protein powder products may have vitamins or minerals added. Whey protein contains high amount of branched-chain amino acids (BCAAs) leucine, isoleucine and valine, and other essential amino acids [52,55]. According to European Food Safety Authority (EFSA), there is no cause-effect relationship between whey protein consumption and muscle mass gain, strength or endurance, increase of lean body mass, decrease of body fat percentage, decrease of muscle fatigue after training, satiety and weight maintenance . This suggests that whey is not a better muscle weight gainer than other proteins; it is calorie intake that affects weight not the type of protein you use. In one study in old women, adding 30 grams of whey protein and 600 mg of calcium per day did not have any beneficial or harmful effects on bone health . There is insufficient evidence about beneficial effects of whey in treating HIV/AIDS  or reducing allergies in formula-fed infants . Whey is possibly safe to use for most adults in single doses up to 50 grams, or 30 grams per day for 6 months . According to Natural Medicines Comprehensive Database, whey may case low blood glucose levels (hypoglycemia) in individuals with diabetes mellitus and increase the risk of bleeding in individuals with bleeding disorders . There are insufficient data about whey safety during pregnancy . In individuals with lactose intolerance, whey supplements that contain lactose can cause bloating, nausea, loss of appetite, abdominal cramps and diarrhea . Individuals with milk protein allergy can experience itching and swelling of the face, rash, nausea, vomiting and diarrhea . In one 27-year old male weightlifter, supplementation with whey for 4 weeks and creatine for 8-9 months resulted in cholestasis (bile retention in the liver) with jaundice . Other side effects may include excessive thirst, fatigue, drowsiness, sedation and headache . Casein is the main protein in cow’s milk and cheese . Allergy to casein is possible but is less common than allergy to whey protein. Branched-chain amino acids (BCAAs) and other amino aids are available as tablets. Individuals who have severe food protein allergies, chronic pancreatitis or malabsorption disorders can get amino acid-based medical foods as a source of protein . Patients who cannot eat due to gastrointestinal disorders or need bowel rest after surgery, can get an infusion of amino acids into a vein as a source of protein . Whey, casein and amino acids are not on the World Anti-Doping Agency (WADA) prohibited list . NOTE: Whey and other protein supplements are not the same as the illegal anabolic androgenic steroids. An infusion of albumin, a type of blood protein, into a vein can be used to restore blood volume in shock or to replace lost albumin in nephrotic syndrome or burns . Small amounts of protein in urine are normal. Vigorous exercise, cold or heat exposure, emotional stress and normal pregnancy can transitionally increase the amount of protein in urine. Some people have proteinuria when standing, so during the day, but not at night when lying down (orthostatic proteinuria). Common health disorders with increased protein excretion in urine include systemic infections, urinary tract infections, kidney disorders (nephrotic syndrome with facial and feet swelling), heart disease, high blood pressure (including high blood pressure during pregnancy ─ preeclampsia or eclampsia), diabetes mellitus (excessive urination, fatigue), rheumatoid arthritis, systemic lupus erythematosus and certain cancers, lithium, lead, mercury intoxication . High-protein diet does not likely increase urine protein levels in healthy individuals but can do so in those with a kidney disease. A typical symptom of increased protein in urine is foamy urine. Water. Each gram of protein you consume requires about 8 grams of water in order for the waste products of protein metabolism (urea) to be excreted in urine . So, for every 100 grams of protein you consume, you can lose about 800 grams of water with urine. You can easily replace this loss by drinking water, so a high-protein diet by itself does not cause dehydration. Zinc. Protein slightly increases zinc absorption . Adding small amounts of animal proteins to legume meals can significantly increase zinc absorption . Magnesium. Severe protein malnutrition may impair magnesium absorption . 1. What is organic protein? Chemically, all food proteins are organic substances. However, to be “certified organic”, a food product has to have a certificate, for example, in the US, the “USDA organic” certificate. Certified organic foods are produced without the use of artificial fertilizers, pesticides, growth stimulators, hormones or antibiotics and they do not contain synthetic colors or preservatives. Speth JD, 2010, The Paleoanthropology and Archaeology of Big-Game Hunting: Protein, Fat, or Politics?